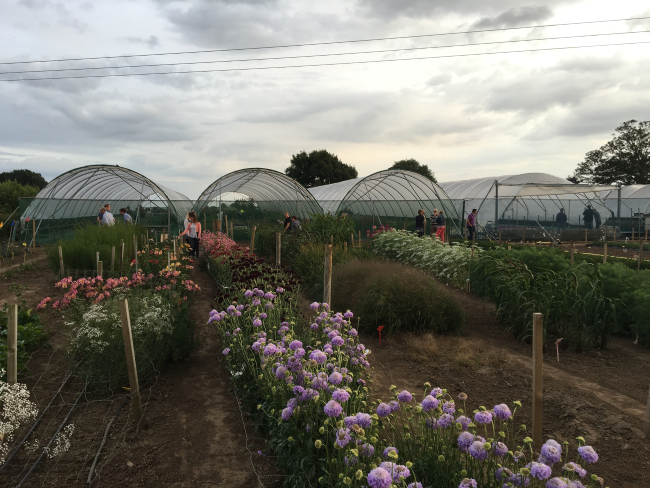 Funded by AHDB Horticulture the National Cut Flower Centre (CFC) has been confirmed for a further five years, with a broadened remit to research crop protection and nutrition. The CFC will continue to identify new commercially successful cut flowers to the UK market and begin new trials for 2018 include research into Fusarium on column stocks, in conjunction with University of Warwick, and weed control, supported by ADAS. Budget has been allocated this year to address petal spotting on field-grown sunflowers, which causes losses of up to 2.4million stems per year in the UK. New crops have included varieties of antirrhinum, lisianthus, trachelium and various hardy perennials including hypericum, salix, sedum and viburnum. Why do we have a National Cut Flower Centre? For a long time, the UK had a relatively low per capita consumption of cut flowers compared with other Western European countries, but between the late 1980s and early 2000s, the UK’s annual imports of cut flowers rose from some £125m to around £550m. Over the same period, the value of UK-grown cut flowers remained static at around £50m per year. This shortage of enterprise was attributed to, firstly, a lack of know-how, and secondly, a reluctance to challenge the Dutch flower export market. Therefore, the Cut Flower Centre was developed to become the primary site for cut flower research in the UK. What does the Cut Flower Centre do? The Cut Flower Centre project was set up in 2007, largely with funding from AHDB Horticulture, with the immediate aim to provide information about cut flower crops and growing formats that are new to UK production, enabling UK growers to make informed choices about different marketing opportunities. 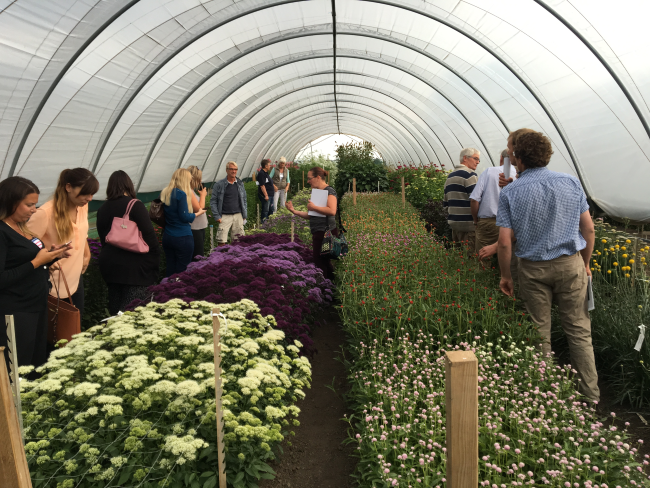 The longer-term aim is to stimulate the UK growers’ interest in developing and commercialising novel cut flowers, while continuing to improve the quality of the more traditional products. Trials include novel variety or species trials, herbicide trials and long-term Fusarium work. How does the centre work? The CFC is here to help the UK cut flower industry as a whole and is run “by the industry, for the industry”. Its strategic direction is driven by a management group made up of key individuals who represent the whole cross section from grower, to packer, to supermarkets. The CFC continues to develop its role as an information hub and cohesive voice for the UK cut flower industry, demonstrated by the popularity at the regular open days. Over the two phases of the project so far, the CFC has hosted AHDB Horticulture-funded herbicide trials resulting in new EAMU applications, developed cultivation recommendations (planting density, continuity of cropping, whether under tunnel or glass, etc.) for 17 varieties or species, identified particular varieties that have good shelf life, determined weaknesses in varieties (such as attractiveness to pests), and established alternative growing media mixes for boxed lilies. Furthermore, a stand-alone trial investigating hydroponic production of cut flowers identified that stocks are oxygen-hungry plants. How do growers take home the knowledge? The work has been widely publicised via a broad range of outlets, including the internet via the CFC website (www.thecutflowercentre.co.uk), various publications (such as factsheets and articles in the AHDB Grower), TV and radio programmes, as well as the ever-popular annual Open Day in early August each year, where growers can view the trials and ask questions of the contractor Lyndon Mason, and the project management group.